In our last blog post, I showed how to create a React app using the create-react-app tool provided by Facebook, and then deploy the app to a content delivery network driven by AWS Mobile Hub, Amazon S3, and Amazon CloudFront. This enables you to produce dynamic single page applications (SPAs) and serve them to a global audience. This downloads the SDK and adds an entry into the package.json file so that the SDK is downloaded automatically when it is needed. In addition, any dependencies for the SDK are downloaded and included in your project. aws-config.js is used by browser sessions to configure the SDK. aws-exports.js is used by SPA applications that are packed (by Webpack, Browserify, or similar tools) to configure the SDK. Sign in to the AWS Mobile Hub console. In this snippet, we import both the SDK and the configuration of the backend, and then automatically create identity credentials for Amazon Cognito based on the configuration. We can also use this to instantiate an Amazon DynamoDB connection or call an Amazon API Gateway REST endpoint using the SDK. // WARNING: DO NOT EDIT. This file is Auto-Generated by AWS Mobile Hub. It will be overwritten. // Copyright 2017 Amazon.com, Inc. or its affiliates (Amazon). All Rights Reserved. You can see the appropriate IDs are available through constants that are then exported as a module. You should never edit this file directly. 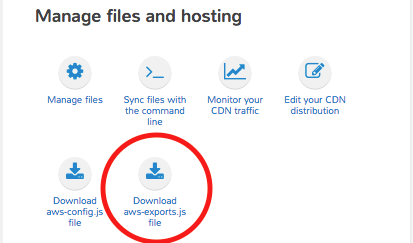 Instead, change the features within your AWS Mobile Hub project and then copy the file to your source code control again. Always use the latest version of the SDK. Add the src/aws-exports.js file to your .gitignore (or similar) file. Do not check this file into your source code repository. Copy the aws-exports.js file from your AWS Mobile Hub project during the build phase of your app.